To Sum It Up: The ability to see faeries has always been part of Aislinn Foy’s life. Raised by her grandmother, Aislinn has been taught to never acknowledge or attract the attention of these dangerous creatures. Aislinn has done her best to live by these rules, but they are of no help to her when the fey’s Summer King, Keenan, decides to make her his queen. He believes that Aislinn can help him restore his power and prevent his sadistic mother, the Winter Queen, from making summer disappear forever. Even after learning what’s at stake, Aislinn still isn’t sure that she’s willing to sacrifice everything about her mortal life, especially her friend Seth, to become part of the very world that she’s always feared. Review: Meh. 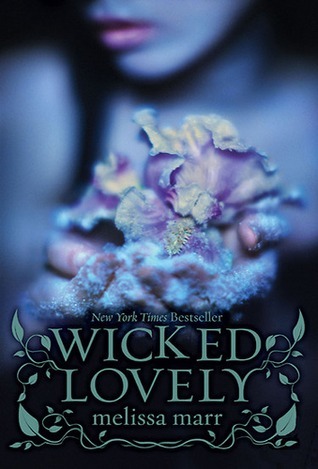 Wicked Lovely started out interesting enough, with a scene depicting the consequences of not being the girl who’s destined to be the Summer Queen. Several chapters later, though, I was still trying to sort out how the whole Winter Girl/Summer Queen/Winter Staff thing worked. Choppy exposition and characters who floated along without leaving much of an impact made this a mediocre read for me. As a heroine, Aislinn isn’t anything special. Whereas the Summer Queen test is explained in dribs and drabs, it’s blatantly clear that Aislinn wants nothing to do with the fey world. Consequently, once she finds out that Keenan is pursuing her to be his queen, Aislinn spends a lot of time fleeing from him. The following cycle develops: encounter Keenan, run away. Encounter Keenan, run away. Repeat a few times more. What really got me about Aislinn, though, was when she accepted a drink from a faery. For someone who’s so afraid of faeries and constantly reminds herself of the rules to avoid trouble with them, you’d think that she’d know a lot better than to eat or drink anything that they offer. She doesn’t. Fortunately for Aislinn, her best friend Seth is there to comfort her when she’s had a rough day being chased by Keenan and other faeries. When the relationship headed for let’s-be-more-than-friends territory, I really got frustrated with the book. I did not buy Aislinn and Seth as a couple. At all. He’s a good listener and a supportive friend, but nothing really stands out about him. Keenan wasn’t that much more appealing as a romantic interest, although I felt a bit sorry for him because his mother, Beira, is such a witch to him (and everyone in general). For me, the best scenes/dialogue in the book were between these two characters. If the interactions between other characters had crackled this much, the book would have held my attention better. The character who I became most invested in was Donia, the last girl who failed the Summer Queen test and must remain the Winter Girl until someone else attempts the test. Her story was both absorbing and sad, and I thought that she was the best written character. Personally, I would have preferred it if Wicked Lovely had focused on Keenan’s courtship of Donia and how she became Winter Girl (with a few guest appearances by Beira for comic relief). Unlike Aislinn and Seth, Donia and Keenan definitely had chemistry between them. All in All: I don't like giving up on a series, even when the first book doesn’t blow me away. The only series that I’ve abandoned so far is The Vampire Diaries, and that was after the third book. Maybe it’s because I always hope that the next book will be an improvement, and if I quit before reading it, I’ll regret it. Wicked Lovely had a solid hook but just didn’t deliver fully. I’m curious to see if the follow-up does, so I’ll hang in there for at least one more book. Great honest review Lee :) !! I didn't like Wicked Lovely that much either and I the second book wasn't any better .. I'm hoping you'll enjoy the other books in the series if you do continue reading it :) !! It's a pretty quick read. I liked the premise of the book but think that the execution fell short. I'd love to hear your opinion if you decide to read it! I was going to borrow the second book the last time that I went to the library, but I already had a pretty sizable stack in my arms by the time I got to the "M" section, lol. Maybe next time. Please, please, please do not give up on this series! Ink Exchange has so many beautiful dynamics. Leslie is such a better female protagonist and Niall and Irial will break your heart. Their relationship reminds me of Magnus and Will from TID, but with more of a romantic past. But..once again, the series drops a bit at the third book, but picks right back up in the fourth book! I have yet to read the fifth one, but I hope it is great. The second and fourth books are the darker ones, and I think the darker ones are clearly the better ones.